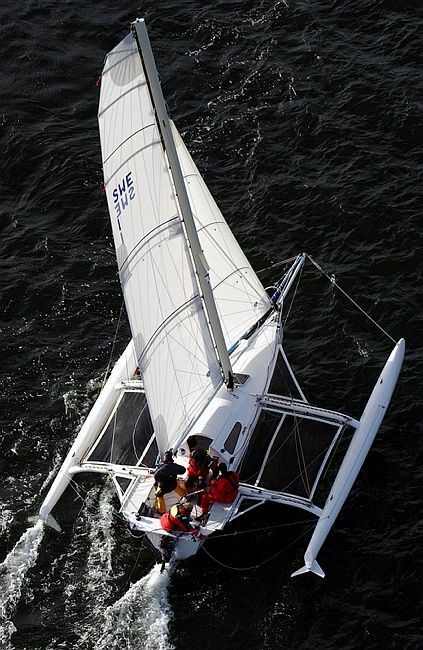 In low wind strengths of 2-8 knots the CATRI functions as a conventional trimaran, though with the advantage of assymmetrical daggerboards and a bigger rig / larger sail area than most boats of this size (which is possible due to the increased stability from the foils). In these conditions the float-mounted stern foils and the windward daggerboard are out of the water, minimising drag (Fig.1, A). At boatspeeds of above 5-6 knots the horizontally mounted rudder foil comes into action, minimising back wave, and associated drag at the rear of the main hull (Fig.2, B). As the wind strengthens the CATRI hydrofoil system comes fully into action. On any point of sailing, other than running downwind, the CATRI is supported primarily on three points: the rudder mounted foil and the two leeward float-mounted foils (Fig.1, C). The V shaped bottom of the leeward float skims the water surface, minimising drag (and thus maximising speed and efficiency). Lift to windward (prevention of leeway) is provided by the forward float-mounted hydrofoil (being angled at about 50 deg. to the horizontal, across the boat, it provides both horizontal and vertical lift). This is an assymmetrical foil, intrinsically much more efficient at providing such lift than a conventional symmetrical centreboard: thus, windward performance of the CATRI is exceptional. The leeward float acts as a powerful water surface sensor, ensuring that the rear foil is always correctly angled to the water surface. There are minimal moving parts (except for raising and lowering the forward float mounted foil, as you would with a conventional centreboard), and the hydrofoil system is largely self tending. In this operating mode, all-round performance is truly exceptional, with the hydrofoil system acting to maximise speed and stability. Boatspeed at wind strengths of 8-20 knots, at an angle of 90-100deg to wind direction, is calculated to be 1.3-1.5 times wind speed (based on testing of prototypes). 25 knots should be easily attainable, and 30 knots looks distinctly possible. Running directly downwind, both forward foils are lowered, the rear float-mounted foils are not in contact with the water and the rudder mounted foil is providing some main hull lift aft: the bottom of both floats is skimming the water with minimal drag (Fig.1, B). The maximum speed of 30 knots has been calculated to be achievable with a wind speed of 13m/s with true direction of 100 degrees, first reef taken, empty boat, three crew at the stern and nearly flying the principle hull. This obviously requires some training!